Membership – Connecticut Professional Genealogists Council, Inc.
Professional development: The first hour of each meeting is devoted to professional development through our programming activities. Networking: Meet, discuss and learn from other genealogy professionals. Volunteer: We partner with local community organizations to bring Ancestor Roadshows to their town. 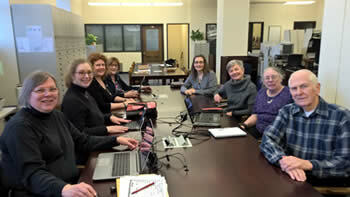 Volunteer to be one of our on-site genealogists. Government relations: We engage with government officials to influence legislation that affects the genealogical community. Increase your visibility: We provide potential clients access to our list of members. Membership is open to genealogical researchers, writers, publishers, instructors, lecturers, managers of genealogical records, H & G librarians, and genealogists serving heritage and lineage societies. All members agree to abide by our Code of Ethics. Dues are $25.00 annually. Our membership year runs from November 1 to October 31. CPGC does not prorate membership. CPGC generally holds meetings the first Tuesday of the month at 10 am, except for January, July or August. Variations to the schedule are announced. Most meetings take place at the Emanuel Lutheran Church, 311 Capitol Avenue, Hartford. Limited parking is available in church lot (during meeting only). Please enter in the back of the church through the red door. The church is a block from the Connecticut State Library.